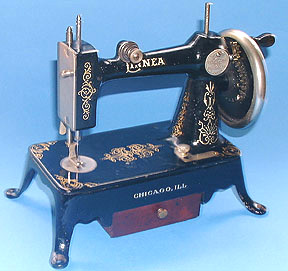 Toy sewing machine - Linnea. Attributed to the manufacturers Bergbom & Roberg, the Linnea was made in Chicago, USA. Production has been suggested as 1920s, but new information indicates an earlier, turn of the century date. The model appeared under the guise of various names including 'Englewood Junior'.